Missa Bay of Swedesboro, N.J., is recalling approximately 1,719 pounds of Chicken Caesar Salads. 9.95 oz. 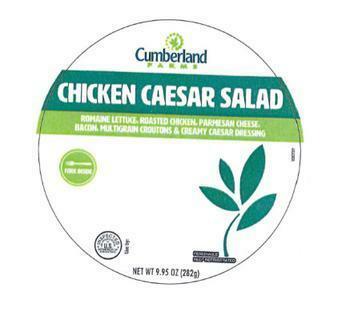 plastic salad bowls containing “Cumberland FARMS CHICKEN CAESAR SALAD with ROMAINE LETTUCE, ROASTED CHICKEN, PARMESAN CHEESE, BACON, MULTIGRAIN CROUTONS & CREAMY CAESAR DRESSING and bar code: 042704 034301, with a use by date of August 16, 2017. The recalled product, bearing establishment number “P18502B” on the front of the product label, was shipped to Cumberland Farms retail locations in Connecticut, Maine, Massachusetts, New Hampshire, New York, Rhode Island and Vermont. Customers who purchased the recalled products should not consume it, but throw it away or return it to the place of purchase. Consumers with questions about the recall may contact Kel Kelly, at (781) 690-3213 or by email at kel@kelandpartners.com.